This tool is used for finding duplicated clients / suppliers cards, merging these cards and for additional available advanced features. Hyper was designed as efficient CRM system that assists its users to avoid duplicated client cards, by checking each new imported lead according to its personal and contact details. These leads will be reported in the Bad Clients Leads tab of Hyper's "Reports & Lists". 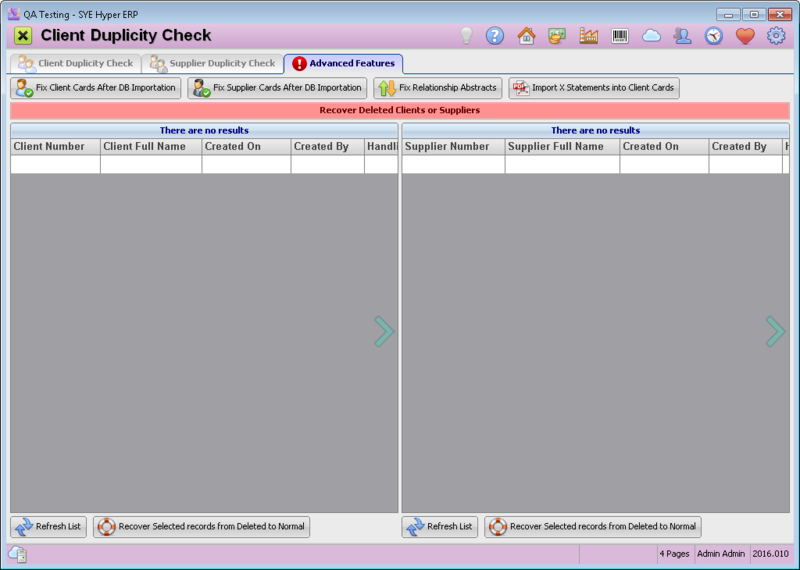 The client duplicity check is usually done after importing clients from a list. For further information about this option, press here. In these tabs, the user can search for the duplicated clients / suppliers (the available actions in these tabs are identical). In order to automatically execute the search, press the Execute button, at the top of this tab. This action will execute a search on all of the clients and suppliers cards, according to their ID number, Phone number and Email address. This process may take a few minutes, depending on the amount of exist client / supplier cards in the system (the searching progress is displayed at the bottom of this tab). Alternatively, the user can choose to search for duplicated cards according to the name fields (Although this option is not recommended), by using the Check Name Fields (NOT Recommended) option, at the top of this tab. All of the cards with identifying field value which is identical to one of the other cards identifying fields, will be displayed. The Group ID field represents the groups of cards with identical identifying fields. The system provides a unique Group ID for each group. The information fields at the bottom of this tab, display the details of the selected client record in the results table. The results table displays information fields for each of the duplicated cards. Additional information fields can be displayed according to the users needs and requirements. This option was designed for merging duplicated cards into the original card. In order to merge the duplicated cards, Select the required card from the results table and press the Merge Duplicated Card button. In the opened window, select the duplicate card as well as the original card to merge it into. This action will merge the duplicate card into the original card, as "Additional contact". The relationship log of the duplicate card will also be added to the original card, as well as the formal documents (invoices, receipts etc.). The details of the original producer of each document will still be displayed on it. Since the process of finding the duplicated cards, fixing their details or merging these cards, may take a while, the system allows to save the results table during this process, and continue at any time by loading it from the saved file. In order to save the test results, press the Save Results to File button. To continue the process, load the saved file by using the Load Results from File button. This tab allows to fix client / supplier card after DB importation, in case that any problem occurs during the process. For example: a client that has made an order, still has the handling status of "New Client" (instead of "Real Client"). Fix Client Cards After DB Importation - Fix the client card fields, according to the current client card details. Fix Supplier Cards After DB Importation - Fix the supplier card fields, according to the current supplier card details. Update the client / supplier handling status For example: a client with handling status of "New" that has a relationship log, will be modified to handling status of "Follow up". Update the client / supplier name Update the "Client Full Name" field, according to the "Last Name" and "First Name" fields. 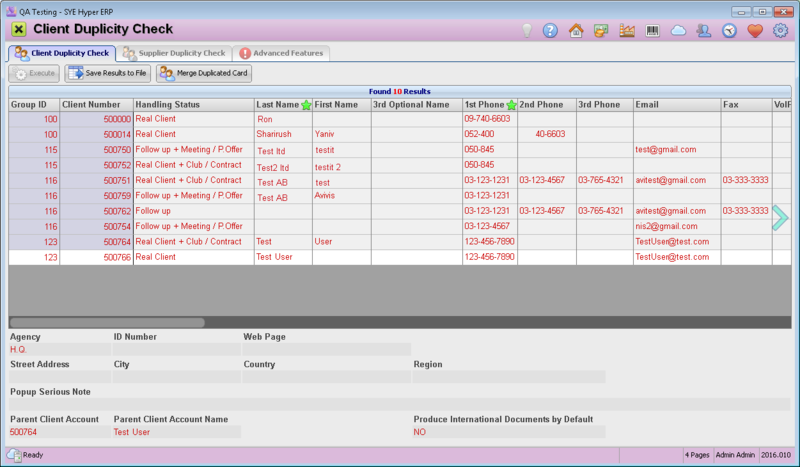 Update the client / supplier relationship Update data in the relationship log of the client / supplier, e.g. "Next Phone call On", last contact details etc. Fix Relationship Abstracts - This action organizes the "Abstract" field of the relationship tab, to make it easily readable, by limiting each content row to 70 chars. Import X statements into Client Cards - Import the automatic statements files into client cards. Refresh List - Display the list of deleted cards. Recover Selected records from Deleted to Normal - In order to recover deleted cards, mark the required check boxes in the Client / Supplier Number field, and press this button.